As the time goes, browsing websites from desktop computers decreasing and using Laptops, Tablets and Mobile devices increasing day by day. So why not to create our website design custom for each type of devices, that fits and looks more attractive for those devices to acquire the visitors entered from those devices. Although you may hire the professionals from the number of web development companies such as digital marketing agency, 10clouds, orange country web design etc. for creating responsive websites. In this post, we are going to provide the basic idea on how to create your website or blog responsive. Recommended: How to Create Simple Blogger Template Easily? Responsive web design is the approach that suggests in which design and development should respond user behavior and environment based on the size of the browser screen, platform and orientation. Responsive web design includes the use of flexible layouts, images and intelligent use of media queries. 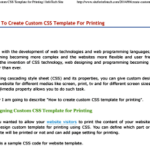 You can make your blogger template responsive by using special tags in CSS. Media queries (@media) are such tags, which helps to make your CSS for every device screen size. You can make many media queries on CSS that matches for each screen size and you can put custom CSS codes for each media queries. Here I have explained some steps for creating your blog responsive. Add the following meta tags on your blogger template using the following steps. Backup your template for the risk while editing template codes. Paste the following codes between and <head> and </head> tags. For website also, paste the following codes between <head> and </head> tags. Add the following codes to size the contents of blog equal to the device width. Add the following codes to size the contents of blog equal to the device width and device height. Add the following codes to size the contents of blog equal to the device width and initial zoom size. Add the following codes to size the contents of blog equal to the device width, initial zoom size and maximum zoom size. Instead or writing meta tags, you can do the same with the following codes in CSS. This works only for Mozilla browser, for other browsers you can use -o-, -webkit- and -ms- as prefixed properties. Add the following media queries between <! [CDATA[*/ and ]]> tags. You can add more media queries according to your need for different screen sizes and orientations and can also use min-width: to specify minimum width of screen. Now, you have to add custom CSS codes for each media queries. The default CSS properties written are replaced by the properties written within these media queries. Here is the sample CSS code written for mobile devices, you can add these codes for media screen with max-width 320 and 480 px. For the alternate method, you can write media queries with custom CSS codes on a single .css file and link it on header part of your blog or website as below. You have to give the full path for “screen.css”, where the file is placed. You can also link different style sheet files for different screen sizes as below.